Triplewax Shampoo, the number 1 selling shampoo. Triplewax Shampoo cuts through all types of dirt and grime, leaving a brilliant shine. Triplewax not only washes away dirt easily, it guarantees a spotless, streak free, shiny surface fully prepared for waxing. Available in 375ml, 500ml, 1L, 2L and 5L. Triplewax Wash and Wax Shampoo is a new triple-action formula that effortlessly deep cleans, shines and protects paintwork in one simple application. Available in 1L. 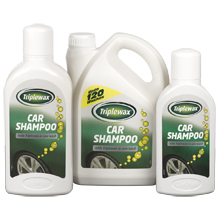 Triplewax Heavy Duty Shampoo special detergents powerfully remove all traces of traffic film, dirt, grease and grime. Available in 1L. 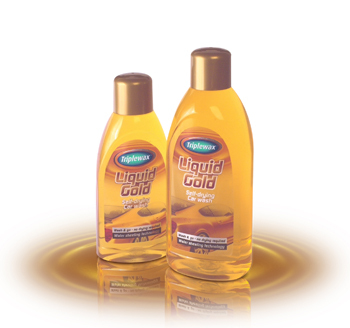 Triplewax Liquid Gold incorporates advanced water sheeting technology so you can wash and go - with no manual cloth drying required. Liquid Gold effortlessly cuts through dirt and grime. Once rinsed the advanced polymer technology forms a mono-molecular hydrophillic coating over the vehicle and then evaporates.